A Patron Saint for Screw-Ups. Psalm 96: 1-3, 7-8, 10. The Twenty-Ninth Friday of Ordinary Time. 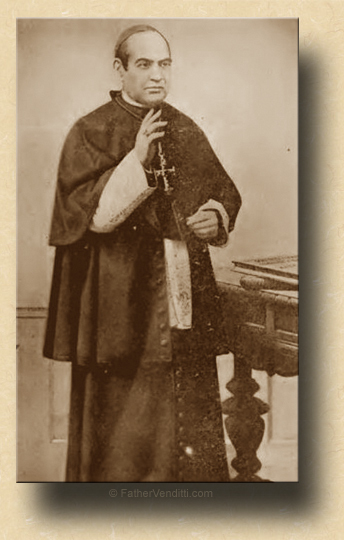 The Memorial of Saint Anthony Mary Claret, Bishop. 2:50 PM 10/24/2014 — Twice before I have mentioned in a homily how the Church, in her infinite wisdom, chooses to sanitize the lives of the saints so as to give the impression that their lives were one continual procession of holiness from birth to the grave, but that how the unattractive episodes of their lives can sometimes be more inspiring than the official versions the Church wants us to know. We saw this most dramatically in the case of Saint Camillus de Lellis back in July, whose failure to persevere with the Capuchins was God's twisted way of preparing him for the great work with the sick he was eventually to do, and also in the case of Saint Bernard of Clairvaux in August, whose preaching of the Second Crusade was completely ignored in the Missal and Divine Office. But perhaps the most dramatic example of Holy Mother Church trying to hide from us certain details in the presumption that the laity can't handle the truth is manifest in today's saint, Anthony Mary Claret. Born in Spain, he practiced the weaver's trade as a young man before becoming a priest. He served briefly as a parish priest before going to Rome to work for the Congregation for the Propagation of the Faith, hoping to be sent to the foreign missions; but, they instead sent him back to Spain, where he labored in the home missions, working mostly in Catalonia and the Canary Islands. It was while there that he was appointed Archbishop of Santiago, Cuba, and this is where the official biography of him suffers its own Nixonian missing eighteen minutes: it talks about the many wonderful spiritual books he wrote, his establishment of a couple of religious communities dedicated to spreading devotion to the Blessed Eucharist and the education of girls, and his efforts to educate and form his clergy, but mentions nothing of the fact that his administration of the diocese was a complete and total disaster. He so mismanaged the financial affairs of the Archdiocese that, faced with a revolt of his clergy, the Holy See removed him from that post and arranged for him to become the personal confessor to the Queen of Spain, essentially putting him out to pasture with no pastoral responsibilities, where he could do no further damage to any diocese. It was while he was in Madrid in this nothing job that he became known for his holiness and his austerity of life. While there he also was responsible for spreading great devotion to the Blessed Sacrament and the Holy Rosary. As a bishop, he was entitled to attend the First Vatican Council, and vigorously defended the infallibility of the Pope; but, even these things didn't prevent him from making a mess of his seemingly harmless assignment as confessor to the Queen; having put his foot into his mouth one too many times, he got himself exiled from Spain, and died in France in disgrace in the year 1870. Pope Pius XI, who knew a saint when he saw one, beatified him, and he was canonized by Pius XII. Anthony Mary Claret represents the kind of person we all know, who can't help, through no fault of his own, to ruin everything he touches. We know he wasn't the first saint like this, but it's clear that he isn't going to be the last, either: Pope Francis recently beatified Pope Paul VI, and in his decree of beatification mentions nothing at all of the complete chaos in which he left the Church at the time of his death. We're told that the cause of Archbishop Sheen has been stalled because of some dispute between the Diocese of Peoria and the Archdiocese of New York over the disposition of his remains, but no one is talking about the fact that, during his brief time as Bishop of Rochester, New York, he also had so mismanaged the temporal affairs of his diocese that the Holy See pressured him to resign after only a few years. As I said back on the feast of Saint Bernard, I understand why, for the sake of the simple-minded, the Church likes to whitewash the lives of the saints, but I challenge the wisdom of it for a couple of reasons: first, it gives the impression that, to be a saint, someone has to be perfect in every way, and that's not true by a long shot; but also because, by giving that impression, it derails us from seeking holiness since we are so conscious of not being perfect ourselves. In the Holy Gospel, Jesus calls us all to be saints, but every time we go to confession we become acutely aware of how thoroughly we can screw things up. And this is why I think the Church does us a disservice when it gives us sanitized and histrionic lives of the saints, because sometimes the most inspiring thing about them was how imperfect they were, and the important lesson that holiness is not the same thing as competence. I also think we miss an opportunity, in those times in our lives when we know we've made a mess of things, to seek the intercession of some very holy men and women who knew exactly what it means to screw things up.